Located in the Aegean sea, and part of the chain of islands known as the Sporades, Skyros is a very beautiful island and is a perfect holiday destination for those who are seeking a more traditional and authentic Greek island. It is the largest of the Sporades islands, though it is located remotely, east of the coast of Evia island and south of the other islands of Skiathos, Skopelos and Alonissos. Skyros is not one of the most well known Greek islands and is most likely one that many visitors from abroad will not have heard of. This however is what makes the island appealing to many. It has managed to preserve its traditions throughout the years, and has not been affected by mass tourism. The Skyros carnival is just one example of an old tradition and celebration that has remained virtually unchanged throughout the years. Skyros is an island that is ideal for those who enjoy peace and quiet, as well as walking and exploration. The dense forested north is in complete contrast to the barren and rocky south, and this diversity makes almost makes Skyros an island of two halves. In the north are the main villages of the island including the capital of Chora. You will find some nice beaches in the northern half of the island, especially the golden sandy beach of Magazia that lies on the north east coast. Villages such as Akitsa and Pefkos are lovely spots to visit if you have the chance, while the town of Chora is a place that all visitors to the island will head to at some point during their holidays. The south of Skyros is very barren and does not provide visitors with much to see. The tomb of poet Rupert Brooke is the main highlight of the south, and this does attract many visitors throughout the year. The famous Skyrian horses used to live freely in the southern part of the island. Today visitors to Skyros can see these beautiful unique horses at a couple of places on the island that works to preserve and care for them. All visitors to Skyros will be based in the northern part of the island, with Chora and the beach resorts of Magazia and Molos being the most popular. It is here that you will find a great choice of accommodation with a number of hotels, studios and apartments located just a few meters away from the sandy beach. There are also accommodation facilities in Chora as well as a few others scattered around some of the more remote parts of the island. There are a number of museums that you can visit and get a better understanding of the history and traditions of the island. You can also see the archaeological site of Palamari which is located on the north coast of Skyros. Excavations are continuously taking place here and are unearthing more history and findings from this very important ancient location. Whether you are looking for a holiday destination to simply unwind and relax, or one where you can explore and enjoy the natural surroundings and peaceful settings, then Skyros is the ideal island for you. It offers an authentic experience of the Greek islands, and one that will leave you wanting to return time and time again. You can reach the island of Skyros by either ferry or plane. Below you can read more about flights and ferry travel to Skyros. The most popular and easiest way of travelling to Skyros is by ferry boat. There is a daily ferry service that connects Skyros with the port of Kymi on the west side of Evia island. The ferry service is run by the Skyros Shipping Co (www.sne.gr) and the “Achilleas” ferry boat is a modern vessel providing a comfortable journey that takes approximately 1 hour and 40 minutes. You can take your car on the ferry and then can explore and enjoy Skyros at your own leisure. Alternatively, you can arrange to rent a car at the port of Linaria when you arrive. The port of Kymi is about 160km from the city of Athens and it takes approximately 2.5 hours to reach there by car. There are also KTEL National Bus services connecting Kymi with locations around the country. You can contact KTEL National Bus in Athens by telephone on ( + 30 ) 210 8317163 for prices and schedules of routes to Kymi. For information about the KTEL services on Skyros, call ( + 30 ) 22220 91123. Skyros has an airport that is located in the northern part of the island that caters for domestic flights from around Greece. If you are flying to Greece then you would need to find a flight to either Athens or Thessaloniki and from there take a domestic flight to the island. The Athens to Skyros route is operated by Aegean Airlines and the journey time is approximately 30 minutes. Flights take place several times a week on Monday, Wednesday, Friday and Sundays. For contact, call ( + 30 ) 210 6261000 or visit the website www.aegeanairlines.com. The Thessaloniki to Skyros route is operated by Sky Express and take approximately 40 minutes. There are three flights a week on Monday, Wednesday and Friday. You can contact Sky Express by telephone on ( + 30 ) 2810 223800 or visit the website www.skyexpress.gr. If you need to contact the Skyros airport, then you can call ( + 30 ) 22220 91876. You can find more information about the airport by clicking here. Skyros is a relatively large island and at just under 210 sq.kilomters in size, it is the largest of the Sporades islands. If you want to really explore the island then you should have your own transportation. If you won’t want to bring your own vehicle, then you can rent a car or bike when on the island. There are local bus services that you can use, but it would be a lot better to have your own vehicle to allow you to travel around where you want – when you want. The majority of the 3000 population live in the capital town of Chora or the coastal town of Magazia which is the main beach area on the east coast of the island. The majority of villages and beaches are located in the northern part of the island which is very green with forests and lots of greenery. The southern part of the island is very barren with a rocky landscape. Roads in the south are nothing more than dirt tracks, so if you are planning to explore the south, make sure you drive carefully. There are a number of picturesque and impressive villages scattered around the northern part of the island. The capital town of Skyros is Chora, and most visitors to the island will make a stop here. Some of the other popular locations include the coastal towns of Magazia and Molos where you will find the famous sandy beach. Below is an overview of the villages of Skyros. The capital town of Skyros is Chora ( though it is also refered to as Skyros town ). It lies on the top of a large hill that overlooks the northeast side of the island. Crowning the top is the castle ( kastro ) which was a Byzantine fortress built on the top of the acropolis. The castle was originally built to defend against pirate attacks as it provided the best view point out over the sea. The monastery of Agios Georgios is located inside the castle, and visitors can make a stop here to visit the monastery and also enjoy the amazing views. Chora is a very authentic and traditional town with square whitewashed houses, colourful garden filled with flowers and the a maze of narrow streets and alleys. All visitors to Skyros will pay a visit to Chora and take a walk around the winding roads. In the main square of the town you will find a large open space where you can take a seat and enjoy a drink and something to eat. There are lots of small shops offering a range of gifts, clothes, jewellery and other products. There is another square in Chora called the Square of Eternal Poetry and here you will find a large bronze statue that was erected in honour of the poet Rupert Brooke, who was buried on the island. From this square you can enjoy some wonderful views over the sandy beach of Magazia and Molos. In the town you will find a number of hotels and other facilities offering accommodation. Chora is a great place to be based when visiting Skyros, but if you do want to enjoy some of the beaches or explore other parts of the island, then having your own transport would be advisable. When you do visit Chora, be prepared for some uphill walking and wearing practical shoes is a must. At the bottom of the village are various spaces where you can park your car or bike if you are visiting from another part of the island. Achenoures is a village located on the central west coast of Skyros, approximately 10km south of Chora. It is a popular coastal town and many visitors to the island come here to enjoy the lovely beach and cool waters. The shallow waters and the well protected bay make this beach and town very popular with families or those travelling with young children. The chapel of Panagia Meglou is located in the village and each year on the 15th August a large religios celebration takes place. Everyone is welcome to attend and join in with the festivities. The natural scenery and charming landscape make Acherounes a very picturesque and relaxing part of Skyros. The port of Linaria is just a 10 minute walk and there you can find a range of cafes or tavernas, as well as a choice of accommodation. The coastal hamlet of Aspous is situated on the east coast of Skyros, on route from the port of Linaria to the capital of Chora. The town is very picturesque and offers some great views stretching out over the blue waters of the Aegean sea. It is the perfect place to enjoy a walk about and take in the beautiful scenery. The neighbouring bay of Achilli operates as a small harbour for the region, and according to mythology, is where Achilles set off on his journey to Troy. In Achilli you will also find the small chapel of Agios Nikolaos, and top of the hill is another chapel, Profitis Elias, from where you can also enjoy some great views. Aspous and Achilli are both popular beach locations and are good choices for swimming. You can find a small number of hotels and accommodation in Aspous, though if you are planning on visiting Skyros during July or August, it would be advisable to book your accommodation in advance. The beautiful coastal town of Atsitsa is located on the north-west side of Skyros and is a very picturesque part of the island, with the dense green forest and vegetation reaching right down to the blue waters of the Aegean. Atsitsa is situated approximately 19 km from the town of Chora and is one of the most unique and beautiful bays on the island. The name comes from the small island that is located very close to the shore. The bay used to operate as a harbour for the iron mines in the region and visitors today can still see the large stone structures that connected the mines to the sea. If you are looking for a place in Skyros to really appreciate the natural beauty and peace of the island then Atsitsa is the ideal place for you to visit. The cultural centre that is located here arranges a number of different events that visitors are welcome to attend. The beach of Atsitsa is a great place to enjoy a refreshing swim, and sailing and windsurfing are also popular here. Located 8km north of Atsitsa is the area of Markesi where you will find the chapel of Theotokos. This chapel was actually built on the same place as a Paleo Christian Chapel and a building dating from the ancient years, which was later discovered to be temple dedicated to Poseidon. Ancient carved graves were also found here. If you are visiting Skyros and have your own transport, then you really should try and pay a visit to Atsitsa and explore this incredibly beautiful part of the island. Located on the central west coast of Skyros the town of Kalamitsa is a traditional and picturesque hamlet with a very long beach and a delightful bay. This part of the island is very popular with windsurfers and there is a windsurfing club near the north end of the beach. The area is very peaceful and quiet, so if you are looking for a place to unwind and relax, then Kalamitsa is a good choice. There are a couple of tavernas where you can enjoy a meal and there are a few places offering accommodation should you wish to stay in the area. A short distance away to the west is the port of Linaria, while close by to the Air plateau is the grave of Rupert Brooke, a British poet who died here during the first World War. The bay of Tristomo is a very picturesque area and was used by Allied forces during WW1. If you enjoy walking and exploring, then Kalamitsa is a great starting point for your ventures into the southern parts of the island. There are also some very interesting coves and sea caves along the coast, though most of these are only accessible by boat. The port town of Linaria is located in the central west side of Skyros and is a very picturesque and beautiful town, that offers arriving visitors the chance to sample the natural beauty and charm that can be found all over the island. There are taxi and bus services that can take visitors to their final destinations on the island, as well as the possibility to rent a car or bike. Linaria is approximately 10km from the capital town of Chora and is the arrival point for all visitors arriving by ferry boat from Kymi in Evia. You can find a number of small tavernas and places to enjoy a drink around the port, which is very picturesque, especially during the evenings. On the top of the hill overlooking the harbour is the church of Agios Nikolaos, and from here you can enjoy some very nice views as well as beautiful sunsets. In Linaria you can find a small choice of accommodation, though it is advisable to pre-book your accommodation should you be visiting during the peak months of July and August. You can also find accommodation in Acherounes, which is just a short walk from Linaria. If you would like to enjoy a sailing excursion, then there are daily boats that depart from Linaria that offer interesting boat trips. If you take a boat trip then you can travel around the coast and see some of the beautiful sea caves as well as the small islet of Sarakiniko where you will find the beautiful sandy beach of Glyfada. Linaria is much more than just the arrival point for many visitors to the island. It is a charming town in its own right, and has much more to offer than would appear at first glance. Located on the east coast of Skyros, under the capital town of Chora, is the coastal resort of Magazia, which is home to the most beautiful beach on the island. Magazia is considered by many to be the beach part of Chora as it is only a 10 minute walk downhill, though it is definitely a village in its own right. The name is derived from the gunpowder magazines that were stored here during the Venetian times. During the summer months you will find the beach filled with people who have come here to swim and relax in the sun. The beach thought is never crowded, and you can always find a nice quiet place to lie back and relax. The beach of Magazia is a very long and sandy one which connects in the north with the neighbouring town of Molos. The waters are shallow and crystal clear, making it a great place for kids to swim. You will find sunbeds and beach umbrellas available on the beach, most of which are supplied by the cafe bars operating on the beach. In Magazia you will find a number of hotels, apartments, studios and other accommodation. The town is one of the most popular in Skyros for visitors to stay, and though development to the area is always taking place, it has maintained its traditional and authentic feel. There are a couple of places to eat or have a drink in Magazia, as well as a mini market and some other local shops. Where Magazia ends in the north, Molos begins, and it is almost as though the two villages are actually just one. The north-east town of Molos is connected to Magazia by the beautiful sandy beach, and is a popular destination for visitors to Skyros. In past years, there was a clear separation between Molos and Magazia, but over the recent years, development has almost connected the two neighbours into one lovely coastal resort. To the north of Molos is a unique area called Pouria where you will find some amazing rock formations and carvings. It is here in Pouria that you will find the church of Agios Nikolaos which is a truly distinctive and unique church that was carved out from a rock. The area was previously a quarrey as is evident from the rocks and formations you will see when visiting here. There is also an old windmill that has been carefully restored and which operated as a cafe bar and tavern. Molos is a little more quieter than Magazia, and is a perfect place to head to in order to enjoy nothing more than the sounds of the sea lapping up against the store. There are a number of hotels and accommodation in the area, and with easy access to Magazia and the town of Chora, it’s a nice place to be based if you want to have a relaxing holiday in Skyros. Situated on the west coast of Skyros, approximately 11km west of Chora, is Pefkos, a very picturesque part of the island surrounded by gorgeous natural scenery. It is one of the most beautiful areas in Skyros and is a place that everyone should try to visit. At the colourful harbour you can enjoy a relaxing walk and watch the fishing boats sail in. The entire area is a very authentic and traditional one and is ideal for those who are looking for a place to unwind and enjoy the peaceful scenery and relaxed setting. There are a few nice beaches in the area where you can enjoy a swim. The main beach in the hamlet is a lovely spot, and there are also some nearby beaches that are worth visiting including Agios Fokas and Diapori. On top of the mountain that overlooks Pefkos is the charming chapel of Agios Panteleimonas. Each year on the 27th July a religious festival takes place honouring the name of the saint. You can go up to the chapel any time of year, and when you reach the top you can enjoy the amazing panoramic views that stretch out over Pefkos and the blue waters of the Aegean. Another place worth visiting is the hamlet of Agios Fokas, which is home to a lovely beach and another delightful chapel. The journey from Pefkos will take you past some wonderful scenery where you can fully appreciate just how beautiful the island of Skyros really is. You will find a great selection of accommodation in Skyros. The most popular location is the north east coast and the towns of Magazia and Molos, where you can find lots of accommodation right next to the sea and the famous sandy beach. You can find hotels with full facilities, as well as apartments and rooms to let. Whatever type of accommodation you are looking for, you will be able to find something for your budget. For more information about accommodation, head over to our section about hotels in Skyros, where you can find details of a range of accommodation on the island. Alternatively, you can visit www.SkyrosHotels.com which has information about hotels all around Skyros, or www.neoptolemos.gr which is the association of accommodation on the island. The Perigiali Hotel is located in the popular coastal town of Magazia, very close to the famous sandy beach. You can find a great selection of quality and comfortable rooms at the hotel, as well as excellent guest facilities including the swimming pool, pool bar and breakfast area. The Angela Hotel in Molos offers an excellent selection of accommodation in a beautiful location just a short walk away from the famous beach. The hotel has a selection of double, triple and guestrooms available, in addition to some great facilities for guests such as the colourful garden area and swimming pool. The Eleana Studios in the delightful coastal resort of Molos, you will find a lovely selection of comfortable studios and accommodation for your holidays in Skyros. All rooms and studios are nicely furnished and have air condition, TV and fridge. For those travelling as a family, there is also an apartment that can sleep 4 people available. Located in the coastal town of Gyrismata in North Skyros is Pelagos Rooms - a beautiful selection of 2-room apartments and studios that are all fully furnished and equipped with everything you will need to enjoy a relaxing holiday just meters away from the sandy beach. When you visit the island of Skyros during the hot summer months, you will definitely be looking for a nice beach where you can enjoy a refreshing swim or relaxation. Skyros has some lovely beaches that are ideal for such summer months. The most famous and popular beach in Skyros is that of Magazia (above image), which is located on the east coast just a short distance from the capital town of Chora. This long sandy beach is rarely crowded even during the peak summer months, and you will find sunbeds and umbrellas on the beach. The beach connects with that of Molos in the north, and continues towards to the area known as Pouria. In Magazia and Molos you will find a choice of cafe bars where you enjoy a drink or light snack on the beach. To the north-east of the island is Gyristmata (above image), which is a small town but with a huge coastline that is very popular in the summer months. Here the blue waters of the Aegean meet the long sandy beach that is approximately 1km in length, and you will easily be able to find a section of the beach that can become your private beach. The beach here is not organised, so you will need to bring your own umbrellas and sun-beds with you. Heading to the north of the island you will find the archaeological site of Palamari. In addition to the ancient site is a nice sandy beach (above image) that is usually pretty deserted, and makes a perfect location if you are looking for some privacy. A few other beaches in the northern part of Skyros include those of Theotokos and Markesi, both of which have nice shallow waters. These beaches can get a little noisy though as they are very close to the military airport and the sound of planes taking off can be quite loud at times. Towards the west side of the island of the town of Atsitsa, which is a lovely and very beautiful part of the island. There is a beach here where you can swim though it might be a little rocky for some. However, a little further north from the town you can find some very nice sandy beaches such as Krya Panagia and Kalogrias where you can lie back and relax or take a swim. Another beach close to Atsitsa is that of Agios Petros (above image), which is a lovely sandy beach surrounded by cedar trees and has a very peaceful and tranquil setting. This beach is a very popular destination in the summer and can sometimes get a little busy. In the central western part of the island you will find another range of lovely beaches. These include the beach of Kalamitsa (above image) which is located south of the port of Linaria. Kalamitsa is a beach that is popular with windsurfers, so if this is your sport, then it is here that you want to head to. There is a small beach in Linaria where you can swim, and a little north of the port is the beach of Acherounes (above image) which is a long sandy beach that is well protected in the bay and has shallow waters. If you are staying in Linaria during your holidays on the island, then this beach is a good choice for you. Another is that of Agios Pefkos where the pine trees reach all the way down to the beach and there is a nice sandy bay where you can swim and relax. Just north from here is Agios Fokas (above image), another lovely beach though access here is a little more difficult which is why not many people will visit this beach and instead remain in Agios Pefkos. One other very beautiful beach that is popular with visitors to Skyros is that of Glyfada, which is located on the small nearby island of Sarakino. To get there you will need to take one of the boats that operate a service from the port of Linaria. These daily boat trips will also take you to see the impressive sea caves of Pentekali and Diatrypiti. Whatever type of beach you are looking for, you should be able to find what you want when you are in Skyros. In the north of the island are more secluded and natural beaches with no facilities. The east coast is dominated by the beach of Magazia and Molos, while on the west coast you will have a number of delightful small beaches to choose from. The island of Skyros is a place of immense natural beauty and there are a wide range of activities that you can enjoy when you visit. The combination of lush rich forests in the north and the rocky barren landscape of the south make Skyros an island of two halves – each with its own charm and beauty, and a great place for venturing out and exploring. One of the most popular activities on Skyros is sailing. The coastline of the island offers a unique and inspiring setting and taking a sailing boat around the island is a great way to see the magical sea caves, gorgeous beaches and visit some of the small nearby islands that offer pure peace and tranquillity. From Linaria you can find boats that offer day trips as well as others that offer you a full sailing holiday on the waters around the island. Whether you want a full holiday onboard a comfortable sailing boat, or an afternoon sail around the coast, you will be able to have whichever you desire. If you enjoy windsurfing then head over to the beach at Kalamitsa which has a windsurfing centre and is one of the most popular locations for windsurfing on Skyros. Another destination that is ideal for windsurfing is Atsitsa. The diverse landscape of Skyros made it a great place for mountain biking. There are a number of cycling routes on the island and it is a great way to enjoy the rich natural beauty of the island. A popular route is crossing from the east to the west side, passing through the capital town of Chora. Mountaineering is another popular activity in Skyros with the two mountains of Olympus and Kohylas being ideal for the sport. The Olympus mountain in the north of Skyros has a peak of 367 meters, while Kohylas mountain in the south has a peak of 792 meters. You can also arrange to have a mountain guide with you if you so wish. Skyros is the perfect holiday for hikers and its beautiful natural scenery make it an island that cries out to be explored. The rich and diverse vegetation found on the north of the island creates the perfect setting for you to enjoy hiking and walking around the various paths and routes. In the north of the island you can walk among the beautiful dense pine forests and enjoy all of the sights and scents of the region. You can walk past the olive groves, down to the beaches and everywhere in between passing magical scenery, small churches and enjoy the nature and wildlife that thrives here. In the south the landscape is much more rocky and rugged, though equally beautiful. The famous Skyrian horses live in the south, and you can see them in small groups in their natural environment if you are lucky enough. Mount Kohylas belongs to the “Natura 2000” areas, which is a European Ecological Network for the protection of wildlife and plants that are endangered or very rare. Bird watching is another very popular activity with visitors to the island of Skyros, as the island is the perfect environment for thousands of migratory birds, and is a major shelter and station for them. In the mountains of Skyros you will have the chance to see a number of endangered species including the Little Owl, Bonelli's Eagle, Eleonora's Falcon, Cory's Shearwater and many others. The wetlands of the island are another important locations for the birds to stop during their journeys, and some you can see here include Herons, the Marsh Harrier and the Red Footed Falcon. If you are interested in the conservation project for the biodiversity of the island of Skyros, head over to www.skyroslife.gr and read more about the project and the Skyros Life Program. If you are interested in getting to experience first-hand some of the Skyros traditions such as weaving and embroidery, pottery and wood-carving ( for which the island is known throughout Greece ), then you can pay a visit to one of the workshops on the island where you can have a go for yourself. You can also take part in a cooking course where you can learn to cook some of the local Skyrian dishes as well as other Greek cuisine. The traditional look of the Skyros House is an important part of the culture and traditions of the island. The houses used to be small in size and lacked proper storage space, which is why many kitchen utensils and metallic plates were hung on the walls, leading to them taking on a decorative value, as well as a practical one. The small size of the houses is also something you will see in the beautiful wooden furniture, especially the small wooden chairs that are an integral part of the home. Inside these traditional houses, the unique decorations, wood furniture and embroidery on items such as cushions and pillows offer a wonderful insight into these traditions that not only have been preserved throughout the years, with the skills and knowledge passed down through the generations, but which define the identity of the island. In addition to the beautiful beaches there are lots of things for you to do and see when visiting the island of Skyros. The island is packed with great sights and attractions as well as various activities that you can enjoy. The two museums of Skyros are the Archaeological Museum and the Manos Faltaits Folklore Museum, both of which are located very close together in Chora. The museums offer a fascinating insight into the history, culture and traditions of the island are something that all visitors should try and see. You can read more about these in the Museums section below. Located 13km north-west of Chora is the archaeological site of Palamari, an ancient site that is providing lots of historic information about Skyros. A fortified hamlet that dates to the Early and Middle Copper Period ( 2500 – 1800 B.C. ) was discovered. There was a port that used to connect the island with the eastern side of Mainland Greece, as well as the Cyclades and North Aegean islands. Excavations that have taken place have unearthed a highly organised city plan with roads and buildings. In some of the houses that were excavated hearths, formatted floors and even ovens were discovered. An array of interesting artefacts were also found including tools made from stone and bone, as well as a number of vessels and metallic appliances. The ancient city here thrived due to the various metals that were once mined here and shipped off to different destinations. At the Archaeological Museum in Chora is a section dedicated to the site of ancient Palamari with various findings, photographs and aerial maps where you can find out a lot more about this fascinating area. During the First World War, Brooke, who was a popular English poet famed for his idealistic War Sonnets, was stationed off Tris Boukes Bay, located to the south west of Skyros. Brooke, and the rest of the platoon arrived on the 17th April 1915, and they were waiting for clearance to head off to the island of Lemnos. After falling ill 2 days earlier due to an inflammation on his lip caused by a mosquito bite, Brooke was moved to a neighbouring French medical ship on Thursay 22 April. He was actually the only patient on board as the ship was actually waiting to pick up injured personal from Gallipoli. On Friday 23rd April, Brooke's temperature rose and lost consciouness. He died in the late afternoon. A little later in the evening, three fellow officers took a digging party to Skyros, and headed to an olive grove that Brooke and a few others had rested at a few days earlier. Brooke was buried just before midnight. Due to the fact that Brooke's party were set to set sail the following morning at 6am, the ceremony that took place was very simple. A wooden cross, inscribed in Greek, was placed at his grave. The inscription on the cross stated ... "Here lies the servant of God, Sub-lieutenant in the English Navy, who died for the deliverance of Constantinople from the Turks". The grave of Rupert Brooke is often visited by travellers to Skyros. The tomb that you will see here today is not the original grave. The current tomb was placed after the First World War and was commissioned by Brooke’s mother. The grave has an inscription of Brooke's most famous poem, "The Soldier", which he had written during the last months of 1914. Reaching the grave of Rupert Brooke is fairly simple. The grave is located in the Tris Boukes Bay, which is on the south-west coast of the island. You will need to head south from the village of Kalamitsa, following the road that is a little rough at times. The road will rise at first as you pass over the mountains, but will then start descending. Heading towards the Tris Boukes Bay, you will find the grave on the left hand side in an olive grove. One of the most popular corners of the town of Chora is that of Poetry Square, also known as Brooke’s Square. It is here that you will find the large bronze statue was that erected in his honour. This statue was created by sculptor Michael Tompros and the square was founded in 1931. From here you can enjoy some of the best panoramic views over the beach and Magazia and Molos, stretching up to Pouria and then over the blue waters of the Aegean. A little to the north of Molos is a very unique part of the island called Pouria. There you will see the remains of an old quarry and the very strange square rock structures that stand dominant next to the sea. There are a couple of landmarks in the area, such as the old mill that was restored and run as a cafe bar, and also the church of Agios Nikolaos. A short distance from the shore are a small scattering of islands, known as Vrykolonisia, which translates as the “vampire islands”. On one of these islands is the small chapel of Agios Ermolaos. The whole area here is totally different to other parts of the island and is an extremely peaceful place. It is a great spot to head to for an evening stroll, and the colours from the setting sun really illuminate the rocks here. A nice evening walk would be starting from the beach of Magazia and following it up to Molos and then Pouria. This church in Pouria is one of the most unique on the island and is well worth a visit. The church is actually built in the inside of a large rock. The large stones in the area had been used for many years to build houses in the area, and building a church inside one of them must have seemed like the logical thing to do. The church is pretty small inside and can only hold a few people, but it’s unique appearance make it a popular attraction with visitors to the island. Located on the top of Chora is the impressive castle, which has stood here proudly overlooking the island since the Byzantine times. The castle was built to protect the island from pirate raids that frequently took place in islands all around the Aegean sea. Unfortunately, the castle has not been as well preserved as others in Greece, but it is still an impressive site. There is a beautiful lion made from marble in the wall above the entrance to the castle. The views from here are incredible and provide you with some amazing panoramas over the island. A temple that was dedicated to Kimisis Panagia Theotokou ( Sleep of Holy Mary - Mother of God ) was built on the top of the castle in 895 A.D. ( the Byzantine period ), and a church was then built in 960 A.D. in honour of Agios Georgios. The Byzantine emperors Nikiforos Fokas and Ioannis Tsimiskis helped with the financial side of things in the chapels construction. The Monastery of Agios Georgios ( Saint George ) was built on the castle on top of Chora, and originally belonged to the Orthodox Patriarchate of Constantinople. Since the middle ages, the monastery has belonged to the Megisti Lavra monastery of Mount Athos. The monastery has undergone a number of renovations and during the 19th, 20th and 21st centuries. Up until 2001 this was a fully functioning monastery. However, a devastating earthquake occurred that year which caused a great deal of structural damage and the monastery was declared unsafe, and closed off for safety reasons. In recent years part of the monastery has reopened and people can now once again visit this reopened lower section. When you step onto the balcony on the west side of the monastery you will see some wonderful scenery stretching across to the mountains. This part of the monastery is open throughout the week and if you see the main doors are open, then you are more than welcome to pay a visit inside. The doors are opened by a monk who operates the small chapel next door to the monastery. There are over 350 churches on the island of Skyros that date back to the Byzantine period, with the majority of these located around the monastery of Agios Georgios. The nationally recognised artist Georgos Lambrou has a workshop situated in the coastal town of Magazia, just a short distance from Chora. Georgos Lambrou has had his works shown at the famous Benaki Museum in Athens as well as at other solo and group exhibitions in Greece and beyond. In the workshop you will be able to see a variety of sculptures and paintings by the artist. He studied sculpture at the Athens School of Fine Arts (1965-1969) and his early works were made with wire constructions, maintaining contact with visual reality and characterized by austerity, stylisation and their interest in capturing the essential. This was followed by hime creating solid bronze figures without limbs nor individuality. You can read more about Georgos Lambrou by clicking here. The coast of the southern section of Skyros is a truly beautiful setting, and you will find a number of impressive sea caves. There are boat trips that depart each day during the summer season from the port of Linaria that will take you on a lovely boat ride along the coast where you can see some of these amazing caves such as Pentekali and Diatrypiti, both of which are found on the east coast and which very impressive and beautiful. The Pentekali sea cave is the smaller of the two and has two small entrances. The Diatrypita sea cave is the larger one with a single entrance. You can actually sail inside the Diatrypita cave if you are on a small enough boat. Otherwise, you will need to dive into the water to explore them both. The famous horses of Skyros have lived on the island as far back as the ancient times, and their preservation has been highly successful. As they lived alone on the island they were not mixed with any other horses and their characteristics have remained virtually unchanged throughout the years. They would usually reach a height of 90-110cm and though they do look very much like ponies, they are not related. Characteristics of the Skyros horses are the larger heads, nostrils and eyes with a strong neck and backbone. Small sized horses such as the Skyrian ones were found all over Greece during the ancient years and there have been findings dating from the Palaeolithic and Mycenaean periods that have shown that these type of horses have lived throughout historical periods in Greece. Horses that were very similar to the Skyrian horse were actually depicted on the friezes on the Parthenon in Athens. The horses would live in small groups that would stay around small lakes and trees, and would remain in the southern part of the island during the winter months. During the spring and summer months they would head to more populated parts of the island when the lakes would run dry. They were used by farmers for threshing and the farmers would always look after the animals, making sure they were well fed and taken care of after working. Today the Skyrian horses are no longer used for work, and due to the high costs involved in feeding and breeding them, their numbers have sadly been in decline for many years. A number of moves have been put into place to help aid their preservation and allow them to remain living in their natural habitat. The two main museums of Skyros are the Archaeological Museum and the Faltaits Folklore Museum. They are located very close together, so you could set aside an afternoon and visit both of them if you have the chance. The Archaeological Museum is located in the capital town of Chora, next door to Brooke Square, and is something that every visitor to Skyros should visit. The museum was established in 1963 and inaugurated 10 years later in 1973, and exhibits various findings from archaeological excavations that have been able to tell the story of the island and it’s interesting history. You’ll be able to see some of the findings from the ancient site of Palamari in the north of the island, as well as from other excavations that have taken place through the years. There are two main halls of the museum, each of which offers a fascinating insight into the history of Skyros with wonderful displays of ceramics, jewellery, vases and other ancient objects of interest. The museum also explains to visitors about the traditions of Skyros, and part of the museum is a representation of a traditional Skyros home, with the various rooms, furnishing, tools and equipment that were common place in homes. This offers visitors the opportunity to literally step back in time and catch a glimpse of what life was like in Skyros in years gone by. The Archaeological Museum of Skyros is small in size compared to other museums around the country, but it is a truly beautiful place to visit. You should give yourself at least an hour to properly enjoy the museum. Entrance to the museum is €2 with a reduced rate of €1. The museum is open throughout the year from 08:00 – 15:00 on Tuesdays to Sundays. It is closed on Mondays, as well as on holidays such as Christmas, New Years and Easter. The Faltaits Museum was founded in 1964 by Manos Faltaits, and was one of the first traditional local museums to operate in Greece. The building of the museum is a beautiful manor which houses a huge range of artefacts and exhibits including bookings, pottery, traditional costumes, woodwork, embroidery and much more. The museum played a big role in the organising and operating of folklore museums around the country, and Manos and Anastasia Faltaits both played a key role in this museum becoming one of the most popular and much loved in Greece. As you walk around the museum, each room provides you with a wide range of items to view, each meticulously selected to offer visitors a chance to enjoy their beauty and importance in the life of Skyros and its people. The traditional Skyros costumes are a popular exhibit in the museum, and you can view these colourful and beautifully crafted pieces of clothing. The “Skyrian House” exhibitions allows visitors the chance to experience the day to day life of locals and see the types of furnishings found in the average home. The museum also has a section with hundreds and hundreds of books on display, many of which are very old and rare. If you are planning on visiting this beautiful museum, and it is highly recommended that you do so, you should afford yourself at least a couple of hours to properly enjoy and experience everything that is has to offer. For entrance fees and opening hours, please call the museum. During the summer months you will find a range of different places to enjoy something to eat or drink. Around the coastal towns you can find cafe bard where you can enjoy a refreshing drink next to the sea. You should also find some restaurants or local tavernas in the coast towns where you enjoy a tasty meal. In the capital town of Chora you will find a good choice of restaurants, as well as a few places where you can grab something to eat on the go such as a pizza or souvlaki. These places will be open throughout the year, so if you are in Skyros outside of the summer months, then the best place to head to for a bite to eat or something to drink would be Chora. Alternatively, you can head over to the port of Linaria, where you can find a few local restaurants and cafes operating. Seafood is a popular option for dining in Skyros, and you will find a number of places that offer fresh fish and seafood. The island is also famous for lobster, and one of the most popular dishes is lobster with spaghetti. During the summer period, you should head out to some of the tavernas in destinations such as Atsitsa or Pefkos to enjoy a fresh seafood meal. There are a number of local specialities that you should try and sample if you have the chance. Trahanopites are pies made with yogurt or dried milk and are very tasty. You should also try the Ladopita, a bread baked with Skyrian olive oil, which is often served in tavernas and topped with Skyriani Ksinotiri, a local sour cheese. There are other cheeses that you should try such as the local kasseri and mizithra, as well as feta. When dining out, you will usually be offered a local “spoon sweet”, which are delicious fruit preserves. Some other popular desserts include rice pudding or pancakes topped with local honey. The thyme honey that you can buy in Skyros is considered by many to be some of the best in all of Greece. As well as being a lovely treat, it can also make a great gift for a friend of loved one back home. 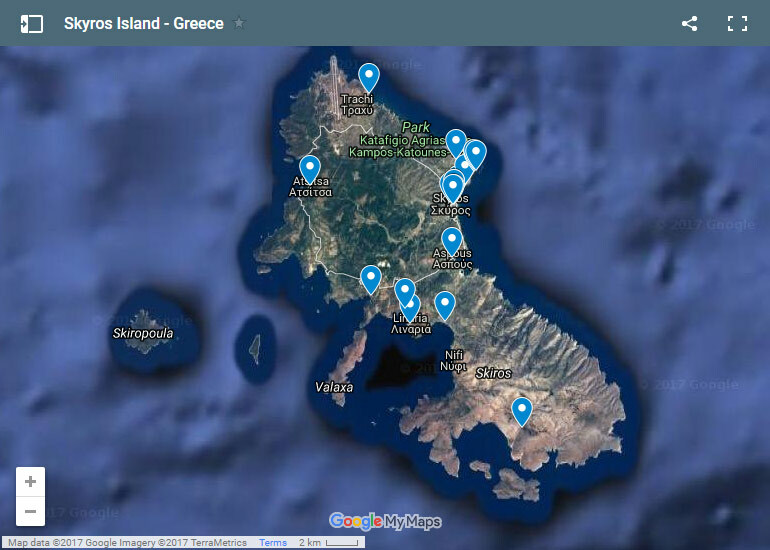 Click on the map image below to load up the full interactive map of the island of Skyros. Below you will find a selection of telephone numbers that might be useful during your holidays to Skyros. Ftoyli – Liassa Kalliopi D.